*This article is ‘work in progress’ will be updated as and when information comes in. Every day, twice a day, over 800 weather balloons are launched around the world at exactly the same time. 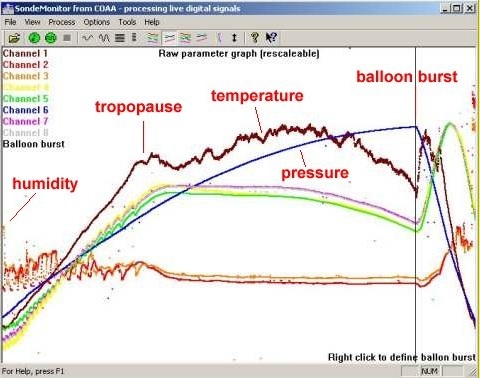 The data transmitted from these radiosondes is received by government agencies and shared with climatologists and meteorologist to develop climate models and predict the weather. The information in most countries is also open for the enthusiast to listen in and make their own forecasts… or just chase the sondes. Here is some information and links to get you going on finding and listening into sondes in your country. Worldwide, sondes can be listened to by using a simple UHF scanner receiver and the soundcard of a PC or laptop. The frequency will vary from sonde to sonde and by country. Signals from Vaisala can be ‘listened to using SondeMonitor software ( http://www.coaa.co.uk/sondemonitor.htm). SondeMonitor decodes the messages from both analogue (6-tone) radiosondes (Vaisala RS80 series) and digital radiosondes (Vaisala RS92SGP and RS92AGP series) using a simple UHF scanner receiver and the soundcard of a PC or laptop. SondeMonitor generates a data file of the raw sample frequency data from analogue radiosondes and the raw hex data from digital radiosondes. SondeMonitor displays the raw measurand data in either table form or graphical form as a quick look and to identify the balloon burst instant. SondeMonitor displays the decoded data in either table form or graphical form (right). A median filter and a smoothing filter are both supplied to improve the signal to noise ratio of the telemetry from analogue sondes that lack the error checking mechanisms of the digital sondes. There are a number of different types of sonde used in the UK, and they work on a number of different frequencies. In the UK they’re on 400-405 MHz and they’re launched each weekday. Another kind of sonde works on 1570 MHz. The UK ones on 400 MHz are all on FM, so you don’t need a specialised receiver (ie, SSB), a normal AM/FM scanner will be enough (Graham Tanner, London). Modem sondes are used in French speaking Africa. RTL SDR – Near [Carl]‘s native Auckland, a weather balloon is launched twice a day, and since they transmit at 403 MHz, he decided to use a USB TV tuner to receive data directly from an atmospheric probe. The hardware portion of this project consisted of building a high gain antenna designed for 162 MHz. Even though the radiosonde transmits at 403 MHz, [Carl] was easily able to receive on his out-of-band antenna.